I have oily skin and am middle aged. My skin started breaking out and I tried many products. This is the only product I tried that worked. This product is wonderful and completely cleared my blemishes within two weeks. It makes my skin look really nice and I think it is reducing the fine lines above my lips. I did not suffer from dryness. I've learned through a ton of other products to not call them a miracle too soon...\, but within a week I am noticing big differences. I'm 20 and 6 months ago I got a case of acne that covered my entire face\, big\, small\, painful\, itchy; so on so forth. I had no choice but to wear makeup since I work in the hair industry and was too embarrassed to show my face anywhere. I tried EVERYTHING... started with products with chemicals.. a little higher grade than just drug store\, went to my doctor tried an antibiotic and a topical cream\, even tried organic a couple of times.. needless to say I was spending far too much on things that weren't working. At this point it has calm down quite a bit though I do still get breakouts that seems to be one after the other and am left with a ton of scars on every part of my face. I decided to go back to the skin doctor I had seen last year even before it got really bad\, she had given me some samples of this product that seemed to help in the short time that had them. I've now been using these products for a week\, both my boyfriend and I are amazed at how quickly everything is healing (also how full the bottles still are). Like I said before I won't call it a miracle just yet but I do see a big difference\, it looks like the problem is being treated instead of just going down and not going away like all the other products caused. I've been using the blemish + age cleansing gel with blemish + age serum at night\, serum10 in the morning along with just a tiny bit of daily moisture. I'm curious to see what it will look like in another week.. not to mention a month. I recommend going to your closest carrier and talking to someone about this product\, it really does make the difference. Wonderful product - my skin looks lovely! I initially bought this product for the occasional pimples and blackheads that I get\, and use it every night. I am a skin care junkie and have tried so many product lines that I can't even count. While it cleared up my skin\, it also made my skin look dewy and ageless in the morning - much nicer than ANY of the anti-aging products that I have used! Also\, you just use a small amount of this at night and the bottle really lasts a long time. Try this! I recently went off the pill and suddenly had to battle acne all over again like I was a teenager. This has worked for me like nothing ever has before! It's incredible. I had the worst break out and this stopped it in its tracks and got rid of all the marks it left behind in less than 2 weeks! Two weeks later my skin is so balanced and hasn't broken out at all. It's like I needed this stuff all along and just never knew it. I have oily\, sensitive and acne prone skin for those wondering. This is my third day using this product\, for day and night.nnThis product has a stinging sensation which is warm and lasts for about 3 minutes once applied. It is unpleasant but you'll get used to it.nnI use this with the LHA CLEANSING GEL\, HYDRATING B5 GEL and SERUM 20 AOX+.nnI must say that my blackheads and acne can now be easily removed(I squeeze them out a lot). The harshness of this product leaves my skin with some slight flaking. Recommended to be used with a moisturizer. It is amazing that a product actually does what it claims to do! I have many skin issues including acne\, oily T-zone and aging. This keeps my skin clear (I can definitely tell when I don't use it 2x a day) and smooth. It is expensive\, but a little goes a long way. It is worth every penny. I'm 21 years old and have only been using this product for 5 day. Within the last 5 days I have noticed an extreme improvement in my skin (less breakouts\, glowing skin\, and faster healing time for previous breakouts) I'm also using the cleanser\, toner\, Prevent\, daily moisturizer and protecting sunscreen!!! Can't say enough about this great product! I am 44 years old. Almost 2 years ago I decided I don't want the 'volcano zits' anymore. I call them volcano zits because they start real deep\, get really big\, and you never know when they're gonna blow. I promise you\, all of you\, that I have not had ONE 'volcano zit' since using this wonderful product. I cannot live without it and it's worth every little penny. When I first started using this project I was so happy. My acne completely cleared for the first time in too many years to count (I'm 37). I don't know if my face built up a tolerance to the product\, or what happened\, but after a couple of months the product stopped working for me. My skin went right back to its previous condition. I still use it every day\, but am looking for something new. This not only keeps my acne at bay\, it also gives me a luminous glow. I only use it once in the morning. There is no itching or over-drying my skin. My pillow and t-shirts also do not get bleached as other products have caused in the past. This product has helped the reduction of acne due to hormones and age. I can se the difference in my skin when I don't wash\, tone and apply my blemish + age defense treatment. I liked this product and it helped with my occasional breakouts. I have very sensitive skin so I was not able to use it everyday. After a year...I had product left but the top of the bottle completely fell apart. The dropper literally came apart and the liquid evaporated. I called the company and they told me that the bottle is only guaranteed for 90 days and I should have used it up by now anyway. Will never order from this company again! There are so many choices out there and so many great products..the last thing I expect for an item which was rather costly is the the container to disintegrate! My Esthetician gave me a sample of this product and i dont think i can ever live without it now. Im 26 years old and i still get break outs and i feel like this product really does help me prevent any break outs. Im going to school to be an esthetician now\, and i will most definately recommend this product to all of my future clients! Def try it\, i guarentee - you will love it! It really works! I use it for a couple of weeks and my skin already looks much better - pores are smaller\, breakouts are rare\, no inflammations under the skin any more\, the skin doesn't get oily during the day. Maybe later\, when I get rid even from occasional breakouts\, I will start using it once\, not twice a day as it contains alcohol\, which dries the skin a bit. But as of today\, I am very glad I've bought it! Love Skinceuticals products! This is another favorite to add to my list. Doesn't dry out my skin like other topical medications. I am a 61 one year old woman who still has oily skin. I experience sign s og aging and still have oily acne prone skin. A coworker was kind enough to mention how rough my skin was (thank you) and I decided to go on an expedition to find the right product for my issues. After nearly five years of searching\, I found it in the Blemish Plus Age Defense! This really works and it only took a couple of weeks for me to notice the difference. I am truly thrilled with this product. I also use the B moisturizing gel and added the re-texturizing serum. I can't say enough good things about this product. It has changed how I view myself and I have added confidence now working in a business world where youth and beauty are valued. I was skeptical about a product to help with acne and aging. But\, WOW it actually does the job. I am very happy with the outcome and appearance of my skin. I am amazed and so happy to have FINALLY found a product that is effective on my adult acne! :-) I have ALWAYS had a couple zits\, but then I keep getting a couple more and am never actually clear. Until now. I saw an immediate difference when I started using this product. It didn't dry out my whole skin\, just the zits themselves. I've been using this product for 2 weeks now and am completely clear. I am amazed and so happy. I have already ordered more so I don't run out and would absolutely recommend to anyone who has been searching for a product to clear adult acne. My skin has never looked this good!! It goes deep and really helps control my acne. I've never found anything like it. I've tried everything and this is by far the best product I have ever used. I ran out 2 weeks ago and noticed a difference immediately. It exfoliates so well that the palm of my hand that I put it in to apply is peeling. This is a highly effective product for oily acne prone skin. The anit aging benefits are excellent too. I've been using this product for a couple weeks now\, and am amazed at how much my skin has already cleared up. I should start by saying that at 32\, I've been battling some terribly nasty acne issues for years. I have incredibly sensitive\, oily\, dry skin and am prone to not only regular run-of-the-mill pimples\, but also to ridiculous cystic acne. Despite trying everything under the sun\, from Proactiv to Skin ID\, from Neutrogena to Clean and Clear\, nothing seemed to make the acne calm down\, and everything seems to only irritate my skin\, only making the problem worse. With my wedding quickly approaching\, I was beginning to get incredibly desperate for a solution. Thank goodness for this stuff. Honestly. I'm amazed. I suffer from hormonal acne and I am in my early 40s. I have very oily skin and use the product twice per day. It is not drying and has done and excellent job of controlling my blemishes and oily shine. When I need a refill\, I am going to purchase the new kit\, which includes the LHA cleanser and toner to see if the full skin care regime adds to the product's effectiveness. This is well worth a try for acne suffers and much better than all of the department store acne lines. I really like this product\, it layers well with the blemish gel and the phyto. It keeps my skin clear and looking great. Love how these products work together without feeling yucky or sticky. When I use only Blemish + Age Defense\, I couldn't get dramatic results. However\, I applied used Blemish + Age Defense on my pimple on top of the organic Tea Tree oil after it dried. Then\, I used Neosporin. All of my acne is gone and I am only left with some scarring. I am a big fan of SkinCeuticals. Thanks again! Blemish + Age has changed my skin! Love it!! My skin looks so much better and feels smoother after using it. I would highly recommend it to anyone\, who wants their skin to look healthier\, smoother\, and more glowing. Love it! I am half way through this bottle and have it had it for about 2 weeks now. Sometimes I use it once a day\, sometimes 3 times a day. I am 38 years old and just started getting acne about 2 years ago. It has been very frustrating and I thought with all the great reviews this would be my life saver. ITS NOT worth the money. I have not seen any reductions in my acne breakouts. I have had some peeling from the dryness\, which I expected. Unless this product starts performing by the end of the bottle\, I am very disappointed! I haven't noticed any short-term benefit to using this product compared to drugstore brands of similar type. I'm pretty oily and I certainly haven't noticed any reduction in blackhead or whiteheads. For the first times in ten years\, I am able to keep my adult acne at bay with Blemish + Age Defense. I am 29 and have acne ever since college\, Funny that I have very clear skin in my teen years. I have tried many product include murad\, proactive\, philosophy\, olay\, etc. The only things that work would be the Acne.org product such as 2.5% Benzoyl Peroxide (BP). But the BP is very drying and makes my skin very sensitive and tender to touch. I also have breakout in my temple area; the BP would irritate my eyes. I addressed my concern to my facial esthetician\, she suggested Blemish + Age Defense. I saw difference in my skin after two days of using this product. My skin had been clear since I used it and have not seen any new acne. I started noticing results in just a few days. I'm 25\, so I'm starting to see a few fine lines around my eyes and mouth that I don't like along with a few pimples around the time of my period. I pair it with the LHS Cleansing Gel at night and I wake up with a glowing\, soft\, acne- and fine line-free face! It's amazing! I don't know what I would do if I didn't find this! This is a GREAT product. I do have some mild adult acne and am approaching my 40's. This product truly does what it says it's going to do. Evens out skin tone\, feels like it exfoliates the skin well and helps with wrinkles. Cannot live with out this product. Since I do have congested skin\, I also use the LHA cleanser which is another amazing product!! A must have!!! I can not imagine living without this product. For the first time in my 40 something life I have NO acne! Thank you\, Thank you\, Thank you! This seems the best of both worlds and a dream product but is it safe and recommended for younger skin (late 20s)? I have clogged skin\, black heads\, pigmentatin and would like to prevent wrinkles. I just started using this product. I couldn't believe how great my skin felt the morning after I used this. This is a must for anyone who has been battling any sort of acne problems. Works wonders!! For the first time in years I don't have to fuss with concealer or foundation. Thank you! I am on my third bottle of Blemish + Age defense. It truly is a miracle worker. I suffer from adult acne now more than ever because I am pregnant. This has been the only thing that has ever worked for me. It stops new breakouts from forming and if by chance a blemish makes it past the beginning stages\, this product will cut the healing time in half. It also has helped my acne/age spots fade. When i started working in the spa industry i was introduced to many many skin care lines because my spa use a variety of products. However when i had my facial done \, she did skinceuticalsl facial. I must say it was amazing! i loved how my face was so radiant and smooth! This product was recommended to me\, and i bought it because i'm very acne prone. You can use it as a spot treatment\, and you can use it with the clarifying mask together. you put little of this product and the mask then spot on the pimples that are coming out at night\, wake up in the morning and wash it off and you pimple is gone and no spots! i'm a spa director i have done many facials with different products but this one was so good. i totally recommend it! it last long. This product smoothes out my skin and zaps any blemishes almost instantly. It is a bit drying so I do not use it daily. But it is very effective in getting rid of any blemishes and it makes the skin appear smooth and renewed. This serum is unlike anything else that I've ever tried. I'm 24 and I have stubborn\, cystic acne mainly along my chin and jawline area. My dermatologist introduced me to skinceuticals and I've been using the LHA cleansing gel and this serum in my skin care routine and I am so impressed that I have finally found something that actually works on my skin!! Granted\, my skin isn't 100% clear after using these products but I am very impressed in how they work because I do feel that they have significantly helped in reducing the amount of breakouts I get. If your in doubt about trying this\, I say go for it! If you have sensitive skin as I do\, it will burn pretty bad until your skin gets used to it. Also\, a little goes a long way\, I think I made the mistake of applying too much. I very much endorse SkinCeuticals blemish + age defense for anyone that has persistent hormonal acne or scarring due to severe acne. I'm 25\, didn't struggle with acne during puberty\, but for the past few years have only tended to break out around my menstrual cycle; for an entire week each month\, I would get painful and deeply rooted blemishes that would take days to surface and then be healed. This is the only thing that has reduced them significantly â€” almost nonexistent. (I get maybe one blemish a month that isn't too much of an issue.) I'm very careful about my skincare routine and use this every morning and night after a cleanser or toner. I've been using this for about three months with consistent results. Also\, I never write review of products but did so this time. Be sure to get this if you're looking for blemish relief!! Since hitting my 30's I've been experiencing minor bouts of acne. I thought once I exited the teen years the acne would go away. the current acne products are geared towards the teen set and can be harsh on older skin. When I first heard of this serum I jumped right on it. I'm already using the moisturizer (day/night for oily skin) and CF during the day. After the first night I noticed a immediate difference in my skin. The few zits that were sitting on my forehead were actually gone and my skin was soft to the touch. After week two I noticed that a pesky wrinkle line (also on the forehead) was very faint. Going on week three my skin just glows. Don't hesitate at all on this. It is worth the expense if you're looking for clear\, flawless skin. Tried so many things\, and then this came along! Tried so many things\, and then this came along! Really made an honest difference. worth the money because of its effectiveness and it lasts a long time (three months or so). Helps with flaky skin and acne scar discoloration. Speeds up 'pimple recovery' time a TON. Amazing product if it's in stock! I've been using this product for years\, but it's been I've been having trouble buying it lately. I've been out for three weeks now. This is the second time I've had trouble buying it. Although I think it's an amazing product\, if I cannot purchase it\, it doesn't do me any good. I am 37 years old and I have tired everything and nothing worked. When my spa lady told me about this I said to myself... it doesn't hurt to try another product. I am happy to say my husband and my mom both have seen my face change within a week. My blemishes are almost gone\, my face looks clean and refresh. Follow the steps to a T and you will be pleased! I love it! and I am sticking to it! this skeptic deems it magic. pure magic! i am 52\, in the throes of premenopause and my always great skin developed microcystic acne. itching\, tiny pimples that would not pop along my jawline and cheeks. An occasional big one that left an indentation. Nightmare!! I dropped dairy\, tomatoes\, chocolate - raided my son's loot for acne pads\, acne gel... not. good enough. Let me say I have bought other brands targeting acne and aging skin and something about their fatty base made me break out more. This is MAGIC! From the first day. i was reluctant to spend this much money on yet another thing for my face but my acne was really bugging me and short of starving or going on oral medication\, i was at my wit's end. I love it. I can't believe I love it because nothing ever helps but this is the good stuff. Worth every dang penny. This product is amazing. I am on my third bottle! I bought with the kit\, and its unbelievable\, I am 37 almost 38 and my skin is just awful : (\, recently I had some weird small acne develop only on my chin\, THEN once a month I had whatever life threw at me\, then I had some weird bumps on the sides of my cheeks\, oh yeah and WRINKLES had begun to set it\, needless to say I was feeling pretty unattractive. I tried this as a last resort\, and let me say\, ITS WORTH EVERY PENNY. 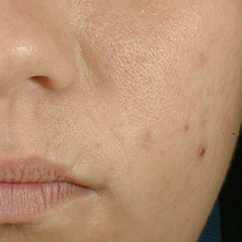 In the beginning it really felt like it tightened everything while immediately reducing acne. Now I use it everyday and night and haven't had any once a month breakouts and my skin looks amazing! Twice a week I do an exfoliate to keep the dead skins cells off and I did buy the night cream and day cream from skinceuticals if its starting to feel dry\, but other than that I'm incredibly happy with this product! Only thing I'm missing is something to remove my makeup before starting this regimen. I love to use this when I'm getting those darn monthly breakouts. It clears them up quickly without over-drying my skin. I use it for a few days when I start noticing congestion. I use it to spot treat blemishes as well. I'm 59 years old and have had acne issues since my teens. This product by far has been the best I have ever used. It is long last\, non drying and soaks directly into the skin. Three drops later if I do get a pimple its life is so short lived and on the surface\, not cystic at all. I couldnt be more happy with it and the more I use a product my skin usually with act up at some point\, but not with this. Try it at least\, you will not be sorry. No reddness\, pores looks smaller and I think it is evening out my skin tone and texture as well. SO good. This the THE best thing I've ever used for acne. I have occasional breakouts of blackhead and whiteheads. Without this product they turn ugly. But if I tap a little of this on\, they disappear in a day or two!!! Amazing. The way I used it a bottle lasts a long time--MONTHS. I learned the hard way that the liquid is caustic to the rubber on the dropper. ?? So I just get what I need and keep the dropper in the box in the little place it is shipped. I try to do all that with as much attention to cleanliness as possible\, so the dropper doesn't touch anything. The little trouble I go through and the little I may waste doing that is worth it. This product is amazing. I have used products with some of the same ingredients\, but they don't work as fast\, as well\, or as reliably as this. Love it! Please don't stop making it!!! If you ever stop making it\, please give us a heads up so we can stock up. I love this product\, using this product along with other skinceutical products my skin has never looked better. I deal with breakouts from on a regular basis. This serum helps control that better. If I do get breakouts due to stress or while going through my cycle\, this help minimize the situation. The breakouts no longer last for days and if I have blemishes afterwards\, this helps in clearing them up. I love using this product and it lasts a long time as you only need a few drops. Very powerful and efficient at fighting my acne! I am 18 years old and struggled with moderate acne all of my senior year. Throughout high school really I felt like I tried every over the counter acne treatment and finally my esthetician referred me to this product and I was super excited. It was fabulous to first week\, then I had a breakout for a few days\, and after that my skin has cleared up tremendously!! My scars from the past year are going away\, my pores are smaller\, the few pimples that I get go away insanely faster\, and I am feeling way more confident running errands with no makeup on. I use the serum morning and night. After I put it on at night I sleep with extra virgin coconut oil on my face to keep it hydrated and it works great. 29 years old and never had acne as a teenager. Two years ago I started having closed comedones and crazy t-zone cystic acne. This product is EVERYTHING. I am using the adult acne kit - can be drying for the first few days so just start off with every other day... but once you adjust.. magic !!! I've waited so long to feel like my old self again !!! Love Skinceuticals !! Thank you ! Despite prescription creams and antibiotics I have suffered from rosacea break outs for years. A nurse at my dermatologist recommended this product. She also suffers from rosacea and called this product 'liquid gold\,' so I decided to try it. It has worked beautifully for me! I rarely have break outs now and if I feel one starting I apply this to it to clear it up before it really develops. At first I used this in the a.m. and p.m. Now that my skin is under control\, I use it mainly in the p.m. I am turning 50 later this year\, but have been asked by my friends who are 12 years younger what I do for my skin. I think my skin looks younger and healthier than it has in years. Besides the Blemish & Age defense\, I use A.G.E. Eye complex (fantastic!) in the a.m. & p.m. I just started using the C.E. Ferulic in the morning and the Physical Fusion UV Defense SPF 50. Also\, received a sample of the Hydrating B5 gel which seems to be working nicely\, especially on my neck. So far I am very pleased with all of the products I have tried from Skin Ceuticals. Even though I am 68\, it seems that I constantly have blemishes! Just constant. I decided to try this product and (knock on wood) i have been blemish free for 2 months! Even my aesthetician mentioned it! I am so excited that this has made such a difference on my face!! Thank you!